Hunting for the best tile cutter is like searching a needle in a haystack. Well, almost. You see, there are a lot of brands and units of tile cutters out there. However, only a few of them can make the cut. Of course, I can understand if you people are persistent about this tool. After all, it is a handy equipment when you are working with flooring and tiling projects that involves porcelains, marble, and other similar material. Whether you are doing a DIY project or professional tiling services, you will need the service of a tile cutter. With this tool around, you can work with any tile material without the fear of inconsistent cuts and breakages. Once the device is operating, it can handle the job fairly easy. However, not all tile cutters work the same. As I said, it is not easy to find the ideal tile cutter that can suit your preferences and needs. That's why in this guide, I am going to show you some of the top options that you can have for this particular tool. Let's cut the chase and get started! It is completely understandable if Brutus 10800 is highly suggested by professional and non-professional tile cutters. This particular tool can ensure satisfaction and error-free performance. It has a multi-purpose design, being able to cut porcelain and ceramic up to 27 inches diagonally. It is super accurate, too. While testing this tool, I have discovered that the tile cutter was produced under the Ishii engineering. This clearly signifies that all of the parts of the item are both durable and functional. The base is crafted from an industrial grade cast aluminum alloy, which has been integrated with heavy-duty rubber pads. Because of these key components, you can expect that tool is stable all the time. Meanwhile, you can also utilize its chrome plated linear ball bearing slides and rail bars. They are the ones that ensure the accuracy and smoothness of your scoring. Take into account that it is using a titanium-coated tungsten-carbide cutting wheel. The latter is not just smart; it is durable, too. The device won't encounter any difficulty even if you score it with tough porcelain tiles. It will just go through to the material without you exerting too much effort. As a result, the Brutus 10800 became one of the most convenient tile cutters that you cause today. It has been notable that the QEP 10999Q is one of the most recommended tile cutters today. Many professionals suggested this tool to me during the process of searching for the top manual tile cutters. According to them, the QEP 10900Q provides the precision and power that are essential in cutting tough and sensitive objects. The cutting power of this tile cutter is ideal for cutting porcelain and ceramic tiles. In terms of diagonal cuts, the tool can rip up to 35 inches and 24 inches, if diagonal. Therefore, it can cut any standard tile sizes, which is usable in your various projects. On the other hand, the device includes an adjustable guide for measurement. You can align this guide to the tile so that you can create accurate cuts all the time. This tool owes its performance to the titanium-coated tungsten carbide blade. The latter has a size of 7/8-inch, which is great for flawless and fast scoring. With this tile cutter, you can make professional-looking tiles. It is easy to operate and maintain, too. The device can be cleaned easily with the use of water and compressed air. Meanwhile, the alloy base of the QEP 10900Q Tile Cutter is pretty wide. Such design enables stability on the tool. There are also rubber pads that prevent the tool from sliding when you are working. QEP 10600BR Pro Porcelain Tile Cutter can be considered as the sister of the QEP 10900Q. It is one of the viable options that you have if you are looking for affordable but effective tile cutters. But despite its price, you can still rely on the power and precision that this power tool has. Just like the rest of the tile cutters here, this tool can cut ceramic and porcelain wall tiles. It can make 24-inch cuts and 18-inch diagonal cuts. Meanwhile, the maximum depth of its cut is 1/2 inch. This tile cutter features a wide and stable die-cast aluminum alloy base. This ensures that the cutting wheel will never harm the entire structure. There are rubber pads as well to optimize its stability while you are working. The cutting wheel of this tool is made from titanium-coated tungsten carbide. It is durable and downright sharp. You can also make use of its bicycle grip handle that provides exceptional leverage. This particular component enables you to cut as quickly as possible without experiencing fatigue and hand strain. Overall, the QEP 10600BR Pro Porcelain Tile Cutter is ergonomic and functional, perfect for DIY projects. Another outstanding tile cutter that you should consider is the Montolit Masterpiuma Evolution 3. It is an innovative tile cutter that is made from Italy. It features multi-functionality, precision, and power, which are all needed whenever you are handling big tile cutting projects and demands. Some professionals claimed that the Masterpiuma Evolution 3 is one of the lightest tile cutters in the market today. This particular feature guarantees that the tool provides a certain level of portability. It won't become a nuisance if you ever want to bring it to your workplace or on-site workshops. However, the best-selling point of this tile cutter is its ability to cut different types of tiles. It can do the task pretty quickly and accurately. It doesn't have problems with consistency as it can cut uniformly. There is also a huge protractor square integrated on this cutting tool. Because of the said feature, diagonal cutting became easy and safe to do. The Montolit Masterpiuma Evolution 3 is using a push handle. It is acknowledged as one of the most efficient levers today. It offers an unadulterated accuracy and control for the user. There is also a self-adjusting scoring system which allows you to cut at consistent speeds. For those who are looking for a portable tile cutter, the M-D Building Products 49047 can become a good option. It is specifically made for contractors who are always on the go. It comes with a nice durable carrying bag so that you can transport it anywhere you desire. The weight of the tool is not bothersome, too. This one can make 20-inch tiles with 5/8-inch depth. It is still a functional tool, even in professional construction projects. However, many people see this as the most suitable option for DIY tasks. Regardless of the intended task, many can attest to the performance and quality of this tile cutter. The tool features a heavy-duty aluminum base. Despite its portable and lightweight nature, the base will never crack and break. It is not susceptible from wearing out either, even its cutting wheel. There is also a ball bearing carriage installed on the system of the tile cutter. From what I know, that said component enables the tile cutter to enhance the smoothness of its operation. All of the parts of the M-D Building Products 49047 Tile Cutter are well-made. They are not flimsy just because this one is an entry-level portable product. It can still survive high-demand jobs and harsh applications. Cutting tiles is not an easy task, especially if you do not have the essential tools to do it. Materials like porcelains and ceramics are both tough and sensitive at the same time. If you use the wrong cutting tool, these materials will break and crack. Of course, nobody wants to damage hefty investments like them. There are two tools that can be used to work with tiles. They are the tile cutters and tile saws. These two machines are highly efficient in slicing and ripping ceramics and porcelains, regardless of their thickness. These devices are also available in different models in which allows you to cut different tile sizes, too. However, what makes a tile cutter different from tile saw and vice versa? You see, a tile cutter requires manual operation. None of the units that I have featured here will work automatically on your whim. You still have to pour an equal amount of effort for you to make the cut. No power source or motors are needed because all the cutting and ripping tasks shall be done manually. Of course, some of you will see this as a disadvantage. For those who require speed and automation on their jobs, tile cutters might not be the best tool to wield. There's nothing to compensate this factor except for the fact that you have the total control over the cuts you make. A tile cutter can cut materials through the use of a cutting wheel. It makes a straight line to the surface of the material that you are going to cut. After that, it will put pressure on the tile until such time it will break. Because it doesn't have any motor, a tile cutter is typically lightweight. They are portable, too, making them an ideal choice for ordinary household owners. Furthermore, they are available in different sizes, too. On the other hand, a tile saw features a diamond blade as its main cutting utility. The blade is being operated by a motor, which in turn, provides automation on your work. While they are working, tile saws typically generate a significant amount of heat. From the spinning of the blade down to the cranking of the motor, these motions produce heat. And so, what this tool did is that it has included a water supply on its system. Every time the tile saw is running, water is being sprayed to both the tile and the blade. In this way, they become cool throughout the entire process. Water also lessens dust. However, because of these additional features, tile saws are burly and heavy. They are not portable, too, unless they have caster wheels, which is not most likely the case. If you put wheels on a tile saw, it will never be stable. You also need to install this tool in an area where you have an access to power and water. Without the two, a tile saw won't run. These are some of the considerations that you have to keep in mind if you are going to choose a tile saw. I am not saying that a tile saw is an inconvenient choice as compared to a tile cutter. Instead, you have to understand that tile saws are essential for jobs that demand extreme precision, speed, and consistency. Moreover, the power of tile saws is ideal for cutting thick materials like marbles. You can do the same task with a tile cutter but it will take some time. In the end, what you are going to choose should depend on your intended application or task. 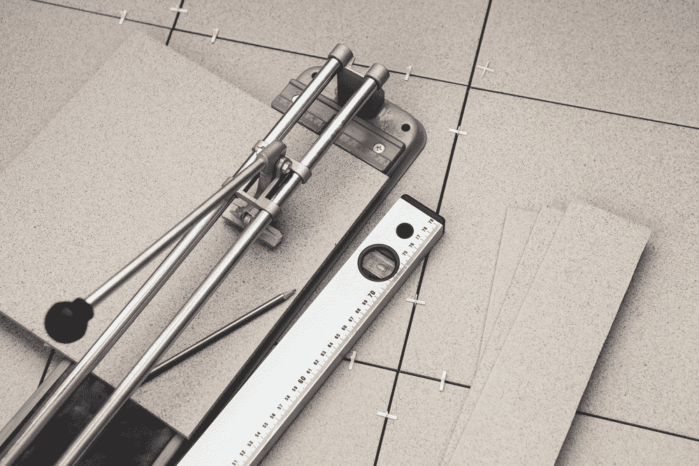 If you just want to accomplish some simple projects in your workshop, a tile cutter is already a good choice. But for jobs with high demands and expectations, tile saws work best. Not all tile cutters have the same specifications. Some of them have commendable qualities while others are seemingly flimsy and undesirable. 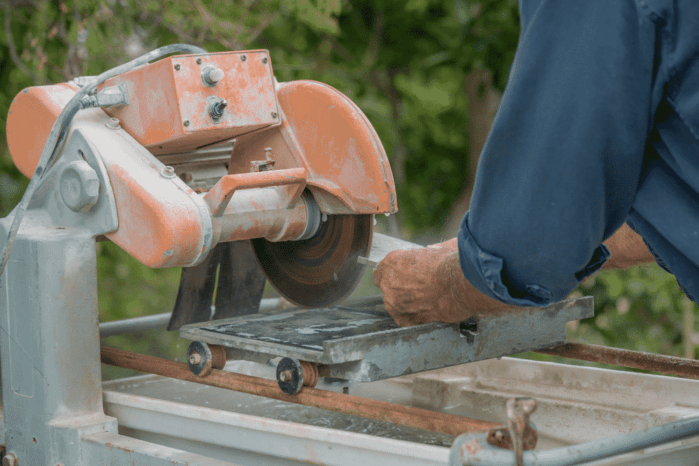 Nevertheless, here are some of the considerations that will allow you to determine which tile cutter can meet your requirements and needs. Whenever you need a tile cutter, you have to think the type of tiles that you are going to score with it. Always consider that all tiles vary in texture and thickness. Do you often work with porcelain and ceramic or do you usually deal with marble and granite? Your answer to this question can lead you the appropriate tile cutter for your desired application. If you are cutting a hard and thick material, make sure that the cutter comes with a blade. In fact, I do recommend that you use tile saws for such kind of task, especially if you have time requirements that have to be met. But for smooth tiles like ceramic and porcelain, manual tile cutters can do the job smoothly and accurately. We expect the tile cutter to survive extended and daily usage. Therefore, its construction should never be cheap and wobbly. After all, we are talking about rugged applications here. 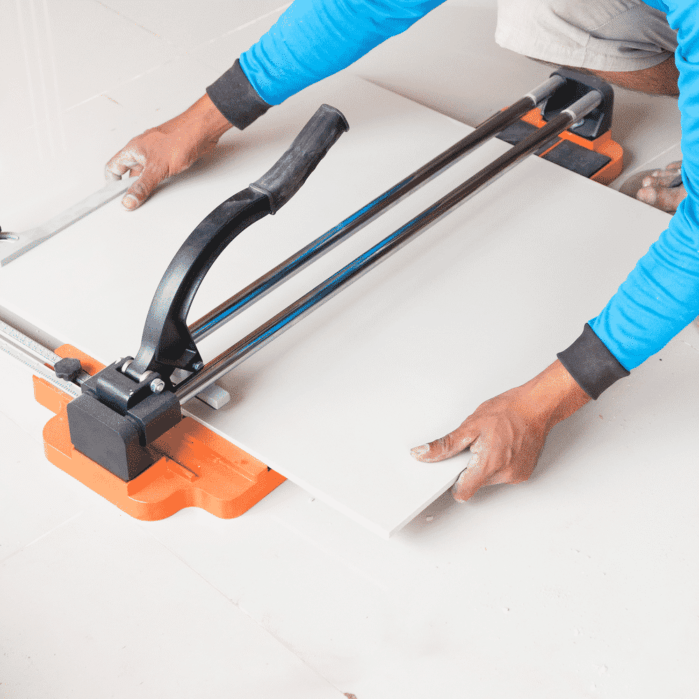 What we want from our tile cutter are two things: durability and sturdiness. All the components, especially the base, should never break and crack. It should not deform, even after years of service. Specifically, you should prefer tile cutters that have a heavy-duty aluminum alloy base and a cutting wheel made from tungsten carbide. These are the standards that should be set to a tile cutter if you want it to last long. Always remember that tile cutters still do come with a price tag. With that in mind, you should choose a durable one that can withstand any punishment that it might meet along the way. You don't want to invest your money in something that would break easily, right? Stability is one of the biggest indicators that separates the good from the bad. Every time you are going to cut a tile, you want to make sure that things would remain in place. You don't want excess movements and wobbling that can disturb the accuracy and cleanliness of your work. A highly stable tile cutter should have a wide and rugged base. This particular setup ensures that the cutter will not move even if you are scoring a thick and heavy tile. Furthermore, the bottom of the base should not skid and slide off while you are working with it. Otherwise, your cut will be swerved away. That's not a good thing at all. I cannot say that a tile cutter is an expensive tool. But at the same time, I cannot consider it cheap as well. This is among those utility items that have a baseline price that makes you ponder. Is it worth investing or should you just ignore it and pass by? For those who are constantly working with tiles, getting a tile cutter (or a tile saw) is a must. After all, that's your bread and butter, right? But that's not the only catch. You need to choose a high-quality tile cutter that can do the job with precision and speed. In fact, you can go with those motorized tile cutters. However, you should be prepared by their price tag. If you see it as a worth-it investment, then by all means, get it. Ignore the price and just think of the benefits that it can give you in the long run. Having the best tile cutter is essential for those people who want an alternative to a tile saw. This particular can provide exceptional precision and performance while dealing with different types of tiles. If you can familiarize their use, you can make smooth and flawless cuts out of them. There are multiple tile cutters that exist in the market today. However, it is clear that the Brutus 10800 Professional Porcelain Tile Cutter is one of the favorites. It offers a great stability and versatility while you are cutting. It can cut large and thick tiles with precision and speed, too. And it should not be forgotten that this tile cutter is well-priced. You can say that it has similar capabilities with the Montolit Masterpiuma Evolution 3. Did you learn from this guide? If you have questions and suggestions, feel free to drop them in the comment section below.